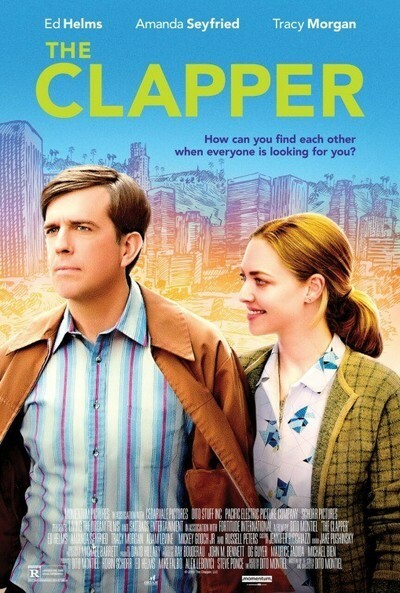 "The Clapper", directed by Dito Montiel, is an adaptation of his 2007 novel Eddie Krumble is the Clapper, about a guy who makes a sparse living as a professional "clapper," those people hired to applaud or ask pre-planned questions in infomercial audiences. In the novel, real-life late night host Jay Leno notices that the same guy is in the audience at all of these different infomercials, so he starts a nationwide quest to discover the man's identity. The anonymous Eddie becomes a media sensation. It's a pretty thin premise on which to base a movie (or a novel, for that matter). There's a critique in there somewhere about innocent humans getting devoured by the celebrity-driven media culture, but "The Clapper" is so poorly done, its tone so lackadaisical and uncommitted, it's not clear half the time what you're even watching. If it's supposed to be a comedy, it's not funny. If it's supposed to be a satire, it doesn't know what it's satirizing. The biggest problem is that the stakes are never high enough to invest in any of it. Ed Helms plays Eddie, a guy content with his gig as a "clapper," traveling to and from the various studio lots with his fellow clapper Chris (Tracy Morgan), and practicing his "spontaneous" questions in the mirror at home. Eddie is not a struggling actor who dreams of being De Niro. He likes the gig as it is. He has a crush on Judy (Amanda Seyfried), who works at a nearby gas station. He visits her there and they share awkward banter through the thick glass screen of her booth. There are no real obstacles for this couple (he likes her, she likes him), and when an obstacle comes it is completely manufactured. Of course, Ed is given a sad backstory, but you never feel like Eddie has come from anywhere. It's hard to "invest" in a character who doesn't want much. Judy is given "quirks"—she owns a goat with one horn, for example—but "quirky" doesn't equal "interesting." The first 15 minutes of the movie shows Eddie's experiences as a clapper. Alan Thicke plays the smooth-talking host of one of the infomercials. Leah Remini plays the woman who organizes the clappers, handing out checks, making sure everyone applauds with gusto. Brenda Vaccaro plays Eddie's mother, leaving him clueless messages on his answering machine about his busy television career. Chris and Eddie do everything together, although it's hard to describe their relationship as a friendship. Neither of them appear to have any other friends. Then, randomly, late-night host Jayme Stillerman (Russell Peters) creates a "bit" out of Eddie's background appearances, and a nationwide "manhunt" begins, Eddie's face appearing on billboards surrounded by the words "WHO IS THE CLAPPER?" This unwanted notoriety gets in the way of his fledgling romance with Judy, and he discovers fame—which he never wanted in the first place—is not fun. In the television series "Extras," Ricky Gervais used the movie extra sub-culture to lampoon show business as a whole. Punctuated by cameos from huge stars playing themselves (Kate Winslet, Ben Stiller, Samuel Jackson), the series made fun of its characters but also went after the competitiveness that makes the larger industry so ugly, not at just the A-List level but the extras level too. When Gervais' character actually does get a break and writes a hit TV show, he finds that fame is not all it's cracked up to be. "The Extras" did what "The Clapper" doesn't do. It used its sub-culture as a way to explore its themes, of fame, need, drive, ambition. It had a strong point of view about its subject. "The Clapper", however, uses its sub-culture as only semi-interesting background for the romance between Ed and Judy, so unromantic that when they declare themselves to one another they have to keep repeating their lines as though they need convincing. There's nothing to hold onto here. "The Clapper" isn't about anything. The cast of is made up of very talented actors. But when even Tracy Morgan seems underwater, when even he doesn’t have one funny moment, you know something is really wrong.